Welcome to the April Newsletter from Hawk Miniatures, we have the last figure from our Assaye figure set released this month more details below. Easter is approaching fast, the Easter bunny has been seen, so while everyone is getting excited over chocolate we at Hawk Miniatures thought it would be a good idea to give all our customers something for the long weekend. So from the 11th April to the 14th April we will be holding a Spring Sale, 25% discount on all orders placed. Our usual rules apply you must have an account on our website and the discount will be applied automatically at checkout. This months release see the fourth and final figure in the Battle of Assaye series. 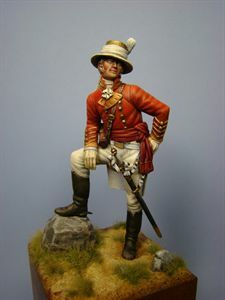 The figure is of Captain William Barclay of the East India Company, this figure has been sculpted by Alan Ball and painted by Eddy Vandersteen.